GuruPoornima Celebrations - Day 4 has been posted, it covers what is MahaParayan and how it will be executed. Anonymous Sai Devotee from Ireland says: Hi all! Om Sai Shree Sai Jai Jai Sai. It is happy to be a part of Baba's family. Sai loves all. Baba is my world. Thanks for giving me the opportunity to tell about our Sai. I am a 23 year old student now residing in Ireland. There was lot of struggle in my life especially in the year 2015 and 2016. That was the time Baba entered in my life. There are many experiences and miracles but I will try to cover all and make it short. I am a divorced girl at the very young age of 21(now 23 years). I have shared about my story and how Baba entered in my life in the previous post (Baba Helped Me Without My Knowledge). After getting divorce I didn't know what to do and later people around me started bad mouthing and spoke about the stuffs which I didn't want to hear. It was very, very hurting. Then I took a decision that I should not be there in India. I desperately wanted go somewhere out of the country. Initially I thought of studying in Bangalore but I thought it would be better if I study abroad. At first all in my family denied because lack of money. Later they granted me permission. After a big struggle with my family I took my IELTS exam. I went to the class and worked hard to meet the required score. After the results I was baffled, I scored very, very less in writing module. It was 4.5(I wanted 6) and in rest of the module I scored decently-listening (6.5), reading (6), speaking (6.5). I was wondering how on this earth it happened. Even the 5th standard school kid can score better than me. And believe me my English is not that much worse. All these days I was worshiping Sai. Even the day before my result I went to Baba's temple (Usually IELTS results will be on Friday). This exam was very, very important for me and I had no other option in my life. But anyhow I couldn't make it. After the results initially I was disappointed but I didn't leave Baba, even the thing which I desperately wanted didn't happen. I didn’t even know that where my life was going. At that time my elder brother got transferred. Then we all moved to a new city. In the mean time I went to several education consultancies and all went in vain. Nothing worked out. All told me without IELTS you can't make it. The exam cost 11k and it was costly. Then reluctantly I applied for IELTS exam again. I left my entire burden on Him. This time I didn’t even touch my book. 2 days before exam I got scared and I didn’t know what to do? 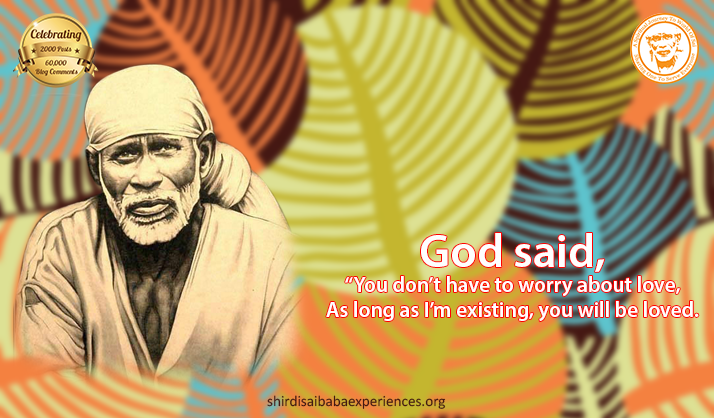 Whenever I feel bad I am used to seeing Sai Baba's photos and stuffs related to Sai Baba. Like that I opened some website relating Baba. There were some messages and I opened it. After reading it I got shocked. "Don’t worry you will clear your exam", it was not a kind of a question and answer blog but it was kind of a blog with Sai's message. My joy had no bounds. I blindly trusted Sai Baba and left everything to Him. For exam we went from one city to another by bus. I was studying Sai Satcharitra in my mobile. I was very worried that I haven't studied properly this time and how could I clear it? The bus stopped at a signal. I saw through the window, on the shop name board there was a big Sai Baba's Photo. Then I understood He was telling me that not to worry. I wrote my exam and the results came. And guess what? Undoubtedly I had cleared it. Only studying hardly doesn’t matters, all one require is His grace too. After some days my mom went to astrologer and asked about my studies. He told that it would be better if your daughter goes after 2017, if she goes now she will be facing problems. Then only I realized why Baba failed me in my first exam. Everything happens for reason. Sometimes we don’t know what is happening but everything happens for good. And finally now I am here. Now I feel very lonely and I have some issues here. I hope Baba will resolve them. Dear friends and Devotees don’t lose hope. Sorry if I took long time, because I wanted to explain everything in detail. Thanks all. Thanks Baba. Om Sai Shree Sai Jai Jai Sai. Anonymous Sai Devotee from India says: I am from Orissa and currently working in Bangalore. My career has been smooth all because of Baba. The only problem of my life is marriage and there's not a day I don't cry. I seek Baba for everything. He has been in my life from 2013. Till date I have never bought any photo or murti of Baba, somehow in strange ways people have given to me or I found somewhere. Sai Ram. Please keep me anonymous. This blog gives me immense strength to keep myself going through all hurdles. The first time I did Nav Guruvar puja was for a friend. He had been jobless for 2 years and was not able to crack any government exam, though he was studying and preparing well. After this pooja he cracked almost all exams. The second time I did this pooja was for my transfer to Bangalore which was not happening. Miracles of miracles, as soon I started this pooja, the project in which I was supposed to work didn't get approval and my transfer got initiated to Bangalore. After my break up, I started the puja again to get him back. But suddenly the supari which I used for mannat got lost from puja room. I considered it as Baba's warning to me that I shouldn't have him back. I took it that way and worked towards moving on and now my life is very nice. My fourth pooja was to switch company; I gave interview in some companies but was not able to crack anything. On my 6th Thursday of this I had cracked an interview, but didn't get any offer letter. I discontinued the puja thinking Baba had abandoned me. But after few months, I again started this pooja for the remaining 3 Thursdays. And yes the very next week after completing the pooja, I got selected in one of my dream companies. I have been waiting to get married. I like a guy but things aren't working between us. So I started puja again for my marriage to get fixed to anyone. After the pooja got completed my marriage got fixed. But I was not able to talk to this person, because I loved someone else. So I started Nav Guruvar puja again to get my marriage fixed to the person I love. Strange enough suddenly the person with whom, My marriage was fixed he showed less interest towards me, his phone was always busy with someone else and then location constraint came into picture and the marriage got called off. I was very happy because of Baba's blessing everything happened. But also the person whom I love is also not talking to me. I seek Baba's blessing to have him back in my life. I know after my pooja is completed, Baba will do everything fine in my life. Please pray that he comes back to me. Anonymous Sai Devotee from USA says: Thanks Baba for vanishing my son's foot pain. 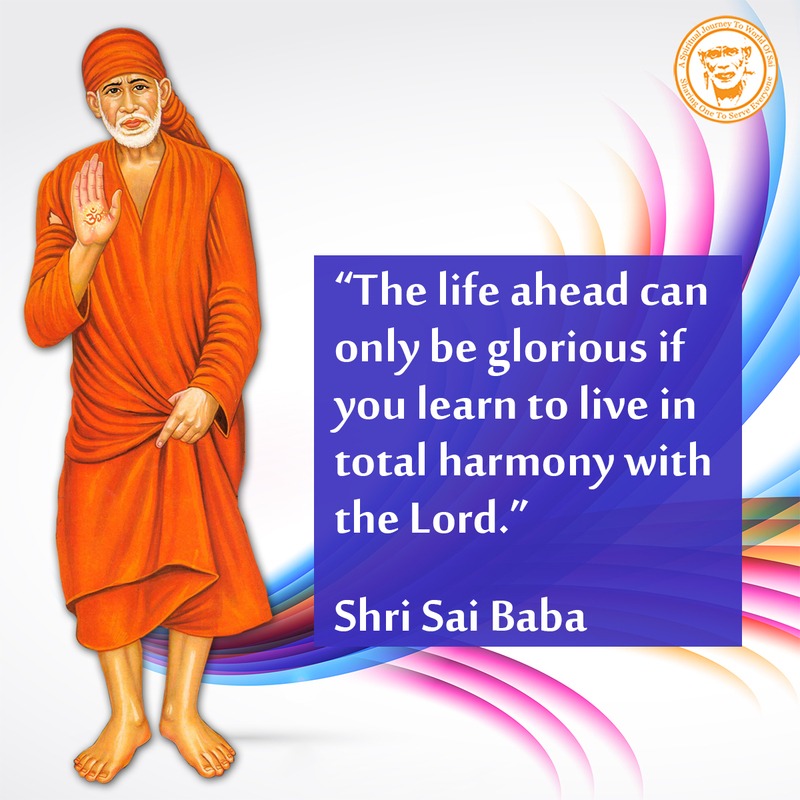 Om Sai Shree Sai Jaya Jaya Sai. Koti kotti pranamam to Your lotus feet Baba. Please forgive my mistakes which I have done knowingly or unknowingly. Thanks for everything. Really need Your blessings Baba. Coming to my experience 10 days back my son’s foot got twisted while he was playing. From that time onwards he was not walking or playing properly. He was complaining about pain when he was putting pressure on his right foot. So I used to worry by watching him like that. Yesterday I prayed and promised to Baba if my son’s foot’s pain gets vanished by today by Your grace then Baba I will share my miraculous experience here, with the devotees. Yes my son’s foot’s pain got vanished. He told me that he was not having any foot pain today while he was walking or running. This is all because of Your grace Baba. Sai Sai Devotee Sairam Sridharan from New Zealand says: I am happy to share what Sai Baba told me on Thursday 16 February 2017. Jai Shri Sairam Devotees. My name is Sairam Sridharan (from New Zealand) who is happy to share my self-realisation which Baba enabled me to come to point on Thursday 16th February 2017. Baba recently communicated through His photograph that I should not waste time in material world and materialistic worldly life but engage myself in doing what He insisted me. Firstly never pray to Him for anything. Secondly never under estimate Him. Thirdly never feel pity of ourselves and our capacity to do good deeds. Fourthly never waste time in this world because this world is full of illusions, family, friends, wife, money and everything because anytime our life can be taken away in form of death. So Baba advised me to read Sai Satcharitra and keep every line, every word and every letter and their meanings on my finger tips with every story remembered from Sai Satcharitra. That way when I die Sai Baba told me that I can keep my mind engaged in Sai Satcharitra and keep my mind filled with thoughts of Sai Baba real stories and try to get moksha! I am very happy for Sai Baba arranging my destination and that too by emphasising on this world full of Illusion And Nothing Is Certain Ever. So only read and memorising and knowing Sai Satcharitra is Real Saviour from worldly and illusionary affairs. I therefore insist all devotees from all communities to read Sai Satcharitra and fill our hearts with Sai Baba’s memories, so that whenever we quit the body and die, Sai Baba’s words would charm us. Jai Shri Sairam. Anonymous Sai Devotee from USA says: I am a Sai devotee since 10 years and perform Sai bhajans. One year back I went to India from USA and came back to India and joined a job in November with Baba's blessings, but due to certain circumstances or fate, I had resigned my job hastily in a month and later realized my mistake and it was too late and could not re-join the company. Since almost 2 and half months I am undergoing lots of stress and pressure and was unable to digest the situations that I was facing. There is no time I didn’t pray Baba. Every minute I was speaking to Him mentally. But, maybe that’s what He desired for me. Then one day I prayed to do Sai Nava Guruvara Vratham and Siddha Mangala Stotram. So far, completed 4 weeks of Guruvar Vratham and the second week I got a call from another company and had interviews and I will be joining the new company on this 27th February by Baba's grace. There were times I thought why Baba gave job and took it away, but there will be reasons behind the act Baba does and unknown to us. Though, I could not completely recover from my past. I believe He will definitely bring me back to normal. May Baba give us strength to face all the tough situations. Please never leave His feet in sad and happy moments. This will bring peace in our life. Sairam! Anonymous Sai Devotee from US says: Hi to all I have already posted my experiences here but still they are not yet published. I am a Devotee of Baba from my childhood, now I am a mother of two kids, and first of all I would like to thank this entire Team who are maintaining this website for all of us. We came to US in the month of July that is on 29th that is end of that month. My elder son was studying In U.K.G in India that time, school starts in India from June. When we came here my son didn't get admission in Minneapolis as he was not 5 years to join in kindergarten that is U.K.G by September 1st he should be 5 years but he was born on October 17th and I was asking our Baba to please help my son to join in school. Where ever we went every one used to ask us was he going to school? Finally today February 15th he joined in school. We moved to other place Houston, by Baba's grace only we came here and today he got admission but he got pre-kindergarten as he is didn't complete 5 years for September 1st , at least he is going now to school and he can learn the slang of English in US instead of sitting simply. I thank Baba for helping us always. Love You so much Sai if there are any mistakes please forgive me Sai. Thank You O Deva for reminding us how to be better human beings through Your Leelas. sai please help me .i dont have job from 13 months.without job u know how i am surviving.also my age is for marriage . Baba what is happening. why I am unable to perform sai nath. Please help my sai nath. my work is happering at very high level. I am unable to perform well. Help me sai nath. please help me to close these positions. PLEASE PLEASE PLEASE HELP SAI NATH. Baba please help everyone with good health and be with us deva and give success in their exams and blees us with two coins shradda and saburi. Feeling blessed that the miracles in my life has been published on a thursday. Its extactly the same day one year back, I met the person I love, but the sad part is now we are completely disconnected. Om Sai Ram, please bless my family baba be with my family love you baba.